Test your knowledge of the Society and the history of anaesthesia with our interactive quiz. 1. 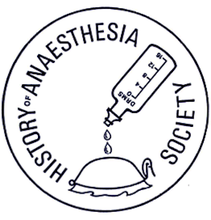 When was the first meeting of the History of Anaesthesia Society? 2. Where was the first meeting of the Society held? 3. Who was the first President of the Society? 4. What sort of wire framed mask is shown on the Society's logo? 5. Who discovered nitrous oxide? 6. Which British pioneer of anaesthesia was born on 28th February 1825 in Aylsham, Norfolk? 7. In the first successful public demonstration on anaesthesia on 16th October 1846, who was the patient? 8. Letheon was a name given to? 9. Who in 1846 coined the term anaesthesia to describe insensibility due to the inhalation of ether? 10. Who in 1853 administered chloroform to Queen Victoria during the birth of her eighth child? 11. Published since 1922, what is the title of the first journal devoted to anaesthesia? 12. Who was the first President of the Association of Anaesthetists of Great Britain and Ireland? 13. The coat of arms of the Royal College of Anaesthetists includes two supporters. Who is shown on the left?